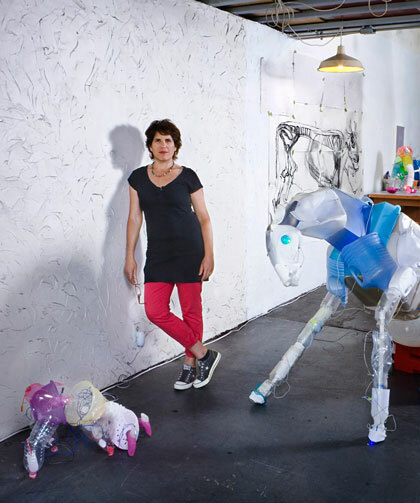 Cynthia Minet’s sculptures, often larger than life and composed of synthetic materials, immediately capture attention. The choice of subject and materials is not accidental; it is a comment on our consumer culture. She explores how science can morph the natural world into something wholly unnatural. Her artworks have been exhibited both locally and internationally, including a collateral event at the Venice Biennale (2009). A recent project, Packing (Caravan), was displayed in 2013 at Los Angeles International Airport. It is a playful yet serious reflection on modern society’s love affair with plastic. The sculptures, made from recycled and repurposed plastic items, create a vibrant energy and playfulness that disarms and makes the art accessible. A professor of Studio Art at Moorpark College since 2000, Minet views teaching as a creative endeavor and enjoys nurturing future artists. Cynthia Minet’s documentation took place in 2008 and was sponsored by Jo Ellen and Steve Lee. The FOTM Archive contains extensive information about this artist.